Luxury barn with a fireplace, hot tub, masseur, spa offer and a pizza oven: Dogs very welcome. A beautiful barn with private hot tub perfect for a romantic break, for ramblers and cyclists exploring Suffolk and Norfolk and for professionals based locally. A masseur can be booked for Indian head, hot stone, therapeutic and sports massages on site. Guests also enjoy a full day at a nearby spa with another hot tub, plus steam room, sauna, foot spa and gym for just £10pp. Shop: 0.25 miles. Pub: 1 mile. Chocolatier, restaurants, horse riding, walks: 4 miles. Owl's Hoot is a charming Grade II listed contemporary conversion of a single storey barn with exposed green oak beams and oak vaulted ceiling in the sitting room and kitchen. The property is located in the village of Stoke Ash, near Eye, with all necessary amenities within easy reach. Inside the property there is a stylish woodburner and bi-folding doors which open onto the garden where there is a private decking and patio area. The village of Stoke Ash has plenty to offer those looking to visit this beautiful part of the county. Within the village there is a post office, a shop located within one of the locals garages selling many essentials and the local pub, The White Horse Coaching Inn, which was voted the 'best bar' within the area by the Diss Express, the local newspaper. Our guests receive 10% off all their meals and drinks at this charming pub within the village. Within one and a half miles the thatched Four Horseshoes is thought to be the oldest pub within Suffolk with a 12th century well inside its restaurant. The historic market town of Diss, with coffee shops, restaurants and pubs overlooking the pretty lake, are within approximately ten minutes by car. Eye and Framlingham, communities with castles, independent shops including a chocolatier and butchers are close by, as are picture postcard villages. Thornham Walks, with 12 miles of woodland walks around an historic estate are within a few miles and there are many beautiful lanes and sites to explore by bicycle too. The Suffolk coast including communities of Aldeburgh and Southwold, the Norfolk Broads, Ipswich with river cruises on offer, and the cathedral cities and towns of Norwich and Bury St Edmunds bustling with history and fine restaurants, are all easily accessible for day trips. 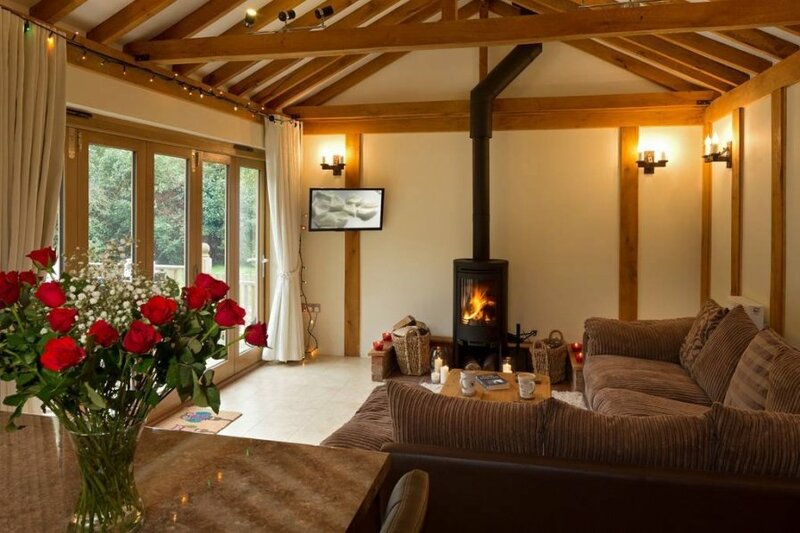 Owl's Hoot is the perfect romantic hideaway surrounded by fields and yet also within easy reach of the A140, A14 and hourly / half hourly intercity Norwich to Diss, Stowmarket, Ipswich, Manningtree, Colchester and London train line. It is perfect for a self-catering holiday on the Suffolk / Norfolk border. Spacious Vaulted Open Plan Room with Sitting Area: Smart TV, 'L' shape sofa, woodburner, bi-folding doors to garden. Kitchen Area: Electric oven and gas hob, fridge with ice box, microwave, water softener, dishwasher, washing machine, breakfast bar with two stools. Garden: Decking with hot tub, and Rattan garden furniture which overlooks a generous lawn. Patio area. Bicycles: Lockable waterproof bicycle store next to the barn. Parking: Ample roadside parking is available on the quiet lane outside the property. Heating: Gas heating and woodburner. Smoke alarm, fire extinguisher, heat detector, and carbon monoxide detector all fitted. Notes: Wi-Fi, towels, tea, coffee and milk and a starter pack of logs for the woodburner are provided at this no smoking property. The barn, which we are sorry is not suitable for parties or events, has a check-in time from 4PM - 2AM (next day). A later check out is available if agreed at the time of booking, for a modest fee and we kindly ask that any damage or breakages are paid for. This is a lovely quiet peaceful rural area and we just please ask you to please be respectful of neighbouring families and ensure they are not disturbed by noise between 10.30pm and 7am. Hot tub for your exclusive unlimited enjoyment.